Hi everyone, I’m Kellie from The Yuppie Files and am very excited to be filling in for Kate today. As a teacher I’ve been reexamining my work wardrobe since school began. I had a baby last August so this is the first time I’ve seen my actual fall and winter wardrobe in awhile! Last year was about making do with loose clothes, this year is about reassessing my own closet. I love preppy clothes and the nautical look is my go-to in the summertime. Even though the weather is colder and I’m back in the classroom I think you can still incorporate little touches of the nautical look into your professional look. I think the key is to avoid overly summery prints like anchors or lobsters and to stick with solids or stripes. 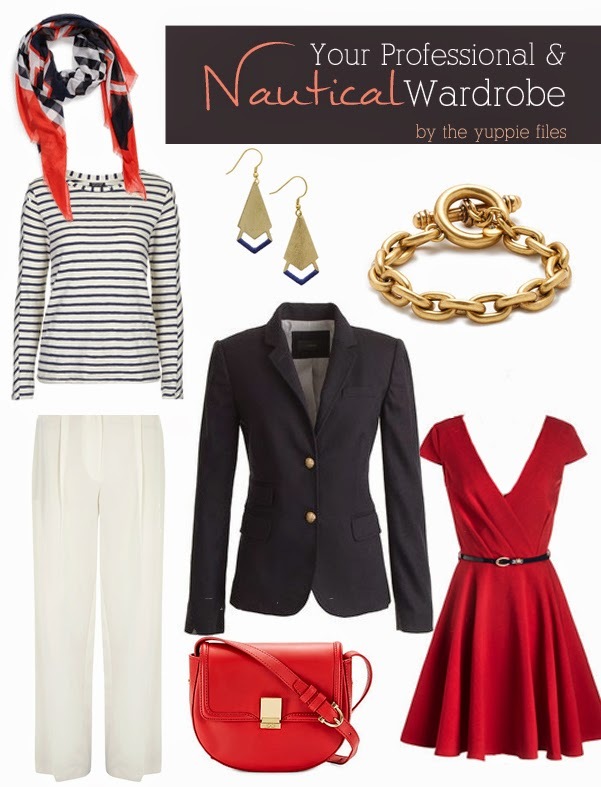 You can add in fun nautical details through jewelry and other accessories but keep the clothes basic. Anchoring (pun so intended) the outfit with a navy blazer with gold buttons gives your outfit that crisp preppy feeling you’re going for and you can easily add on from there.